Flat roofs are the most common type of commercial roofing systems in Toronto because they are efficient, affordable, and easy to maintain. There are also quite a few residential flat roofs in the city, but this option isn't as popular for homes because it doesn't look as aesthetically appealing as pitched tile and shingle roofs. The cost, efficiency, and durability of this system depend on the flat roof materials used during its construction. There are a variety of those available, and choosing the right match for your property is the key to creating a roof that will last for decades. 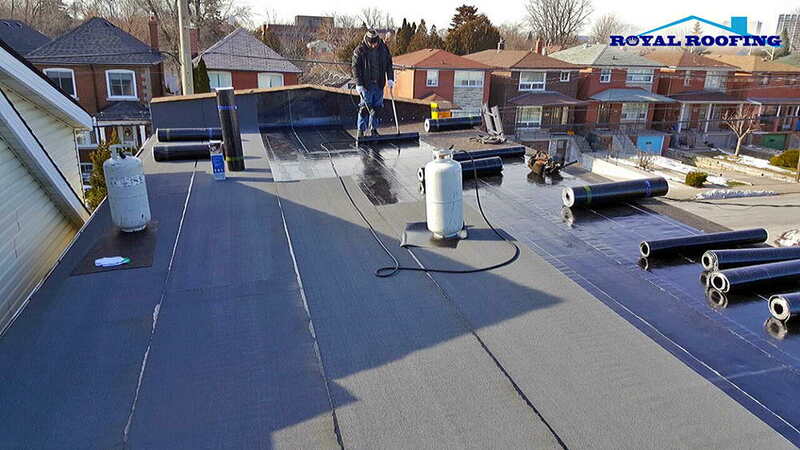 We at Royal Roofing Inc. have years of experience in design, installation, repair, and maintenance of flat roofs all over Toronto. Our specialists will be able to pick the best materials to build a new or renovate an existing flat roof and increase its lifespan. Our team specializing in modern flat roofing materials will consider all your personal requirements and assess the building itself in order to develop a roof system design that will meet your needs. The pros and cons of every material will be explained so that you understand why exactly this configuration is best. The deck is the basis of the roof, This part of the system determines its reliability, so it's imperative to choose the right kind of material for it. This is especially important for industrial flat roofs that will bear extra weight in the form of equipment or goods stored on certain parts of the surface. This deck is unsuitable for liquid or hot melt applied roofing systems. The best choice is steel as aluminum may distort when a membrane is applied using heat. A good and reliable choice for any roofing system. Can be used for any type of roofing membrane. A popular choice in Toronto. Can be used for any waterproofing membrane. There are a variety of flat roofing material options when it comes to waterproofing membranes. Each has its pros and cons, but all of them are durable and can effectively protect the surface from water damage. EPDM is a kind of rubber flat roofing that is exceedingly durable and requires very little maintenance. It's easy to repair, but vulnerable to punctures. PVC membranes are affordable but they are more vulnerable to UV damage. An affordable and flexible option good for commercial flat roofs. The material is vulnerable to chemicals and petroleum products. This group of materials includes Glass Reinforced Plastic (GRP), polyurethane, and a variety of acrylic and polyester compounds. These membranes are very flexible and efficient. They are often used for refurbishment and upgrades. There are a variety of flat roof materials available on the market and one needs to be an expert in the field to choose a combination that will create a reliable roof for any type of building. The durability and price of flat roofing will depend on the materials used. Royal Roofing Inc. has the experience and skills necessary to design and install a flat roofing system that will serve you well for many years.